Holiday treats and feasts are one of the best parts of the season, but many foods commonly served around this time of year can be poisonous to pets or lead to serious gastrointestinal troubles, including pancreatitis. Play it safe and don’t give pets any people foods, and make sure your guests don’t either. Put leftovers away quickly and cover all trash bins to prevent mishaps. The decorations that turn our homes into holiday wonderland can actually put our pets at risk of injury. 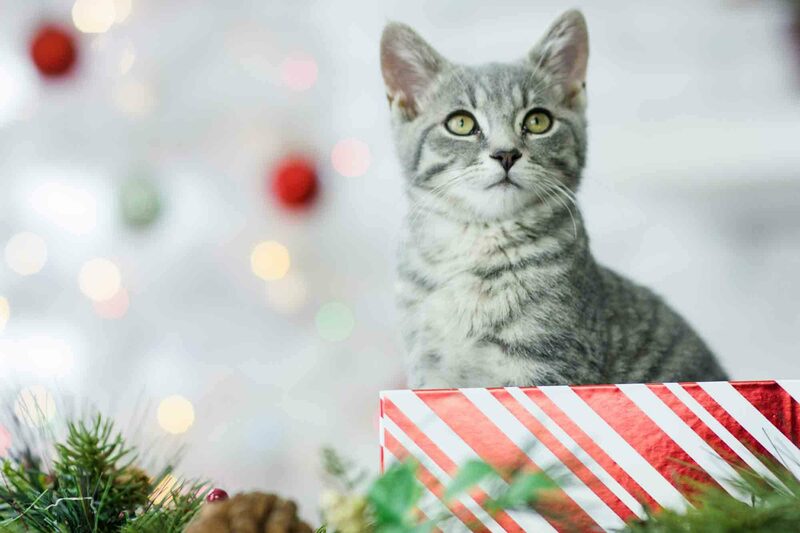 Strings of electric lights can cause entanglement or shock if chewed on, glass ornaments can be broken and stepped on, and tinsel can cause a dangerous intestinal blockage if ingested (many cats find tinsel irresistible). Play it safe by keeping all decor out of your pet’s reach. Your tree is lovely to look at, until your pet gets hold of it. Christmas trees should be anchored to prevent being toppled by a pet. Make sure your pet can’t get at the water, as it may contain toxic levels of pesticides, fire retardants, and preservatives that leach into the water from the tree. Speaking of greenery, many holiday plants such as lilies, mistletoe, holly, narcissus, and amaryllis are poisonous to pets and should not be brought into the home. Poinsettia is the least toxic seasonal plant, but can cause tummy troubles if ingested. Keep their daily routine (feeding, playtime, and walks) as normal as possible throughout the season. Make sure your pet is getting plenty of exercise each day to reduce stress and improve their mood. Set up a “safe room” (furnished with water, bedding, and favorite toys) for your pet to retreat to when guests are over. Accidental escapes can happen in the commotion of guests coming and going. Make sure your pet is always wearing a collar with current ID tags and that their microchip has been updated just in case. Do you have any further questions regarding safe holidays with pets? Please let your team at Harris Parkway Animal Hospital know what we can do to help you and your pet enjoy all the season has to offer!